Jesus is the Reason for the Season! No, I’m not talking about Christmas, I’m talking about Easter! While Easter Bunnies and egg hunts and fancy Easter outfits are a fun part of the holiday, we like to remind ourselves of the real meaning behind Easter. And, of course, we’ve got bling for that! 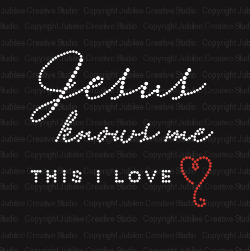 Many of our cross and Christian themed iron on transfers are on sale until Easter. Check out the sale and pick out some cute bling to wear to all those Easter egg hunts! 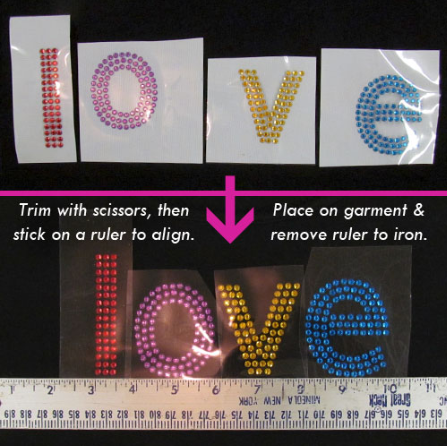 Here’s a great tip for aligning individual iron on letter transfers (or any transfers that you want lined up evenly). Simply trim and peel off the back of the individual transfers and stick them on a ruler to align the letters. Place the ruler with the transfers on your garment and then remove the ruler before ironing. Voila! So easy! And a big congratulations to M. Wade for winning our Old Ragged Cross wall hanging. She said it will hang in her husband’s home office (he’s a minister — how perfect!). Thanks to everyone who entered and shared your favorite hymns. More giveaways coming soon! Spring is here and we’ve got new fabrics in the studio to celebrate! If you’re ready to embrace the bright colors of Spring then these are just the fabrics for you. Our Sunrise Pink 3, Sky Blue Plaid, and Jelly Bean Plaid homespun fabrics mix and match well with the other colors in our Bright Homespun collection. These three new fabrics will be on sale for only $4.45 per yard through the end of March. And good news for all the fans of our Red & Tea Dye Ticking homespun fabric – it’s finally back in stock! This popular fabric will also be on sale for $4.45/yd through the end of March. Our Rainbow Rhinestud Alphabet Letters will are still on sale too. These bright letters are so colorful and shiny they transform anything from boring to fabulous! We just snazzed up this toy box ottoman over the weekend. Each side has a different word — laugh, read, play, and fancy. 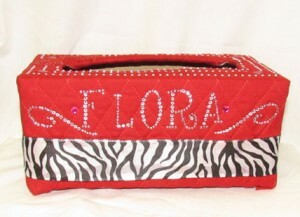 You could also put your child’s name or your family’s last name on a fabric storage ottoman like this to personalize it. 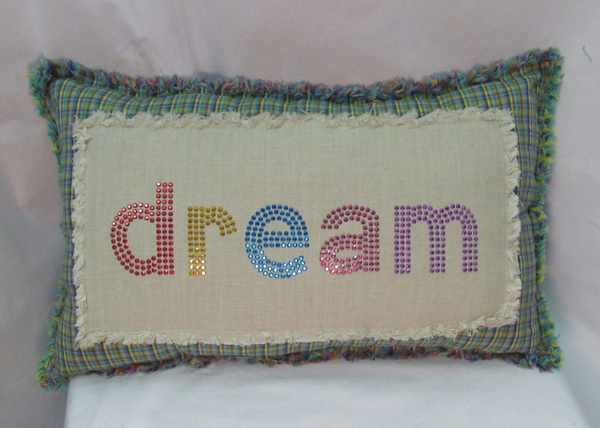 Hm…..Bright Homespun fabrics and Rainbow Rhinestud letters….what would happen if we combined the two??? We’d get this sweet DREAM pillow! If you like it, then it could be yours! We’re giving away this pillow to one blog reader. To enter to win, simply leave a comment on this post. Any comment will work! Entries will be accepted through Monday, March 19th and the winner will be announced on next Tuesday’s blog post. Wow, can you believe Spring is right around the corner? Spring means more daylight hours, Easter, outdoor sports, Spring Break, Prom, Mother’s Day, and the end of the school year. What’s not to love? Have you thought about what to get that special teacher as an end-of-the-year present? Teachers love bling and we’ve got several really cute teacher/educator designs. Iron them on a t-shirt or a tote bag for a unique and practical teacher gift. If none of these teacher designs appeal to you, you could use our new rainbow iron on rhinestud letters to create a special personalized gift with your child’s teacher’s name on it. You could even make a colorful wall hanging for her classroom. Or maybe you ARE a teacher and you dread the weeks of standardized testing at the end of the school year. 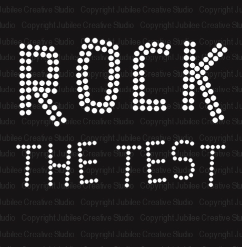 Jazz up those boring tests for yourself and your students with our ROCK THE TEST iron on transfer. This ROCK THE TEST iron on transfer is 50% off until March 14th. Get yours today and motivate your students to do their best with a little bling! All of our teacher/education iron on transfers are on sale through March 14th. You’ve got plenty of time to make special gifts for all the educators in your life! Valentine’s Day is right around the corner! We’ve put together some fun projects to help you decorate for that special day. And to help you get started on these projects, we are having a Sweetheart Sale — everything Valentines-y is 30% off through February 14th. Our first Valentine’s project idea is a Valentine’s Card Box made from an empty tissue box. Your daughter will love collecting Valentine’s cards in this fancy personalized box this Valentine’s Day. And once the cards have all been read she can use this box to decorate her room or to hold special “treasures.” You can find simple instructions for making this special bling box on the project page. 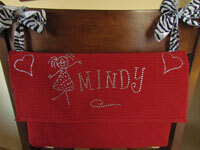 Another option for collecting Valentine’s cards is this chic Valentine’s Bag that hangs over the back of a chair. If your child doesn’t have much desk space, then this might be just what she needs this Valentine’s Day! This super simple project was created using two placemats, some ribbon, and a dowel rod — and then embellished with Jubilee Rhinestones, of course! More photos and instructions for this fantastic blingy bag are included on the project page. Our third Valentine’s project is for the grown-ups! 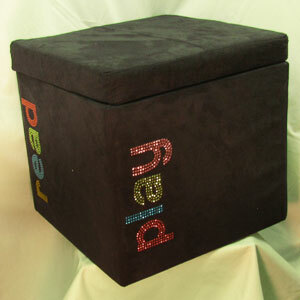 Decorate your office or your home with this soft shabby “rags-n-rhinestones” tissue box cover. 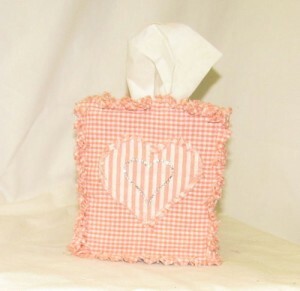 We used soft pink Jubilee Homespun fabrics but you could use hot pink or red or a combination of reds and pinks to design the perfect Valentine’s tissue box cover for your space. And then, of course, you can choose from our many hearts and Valentines-y iron on rhinestone transfers to embellish your tissue box cover. These little box covers are simple to make — easy enough that you could make one for every holiday! Or, with our many homespun fabric options, you are sure to find something that would work in your home or office year-round. 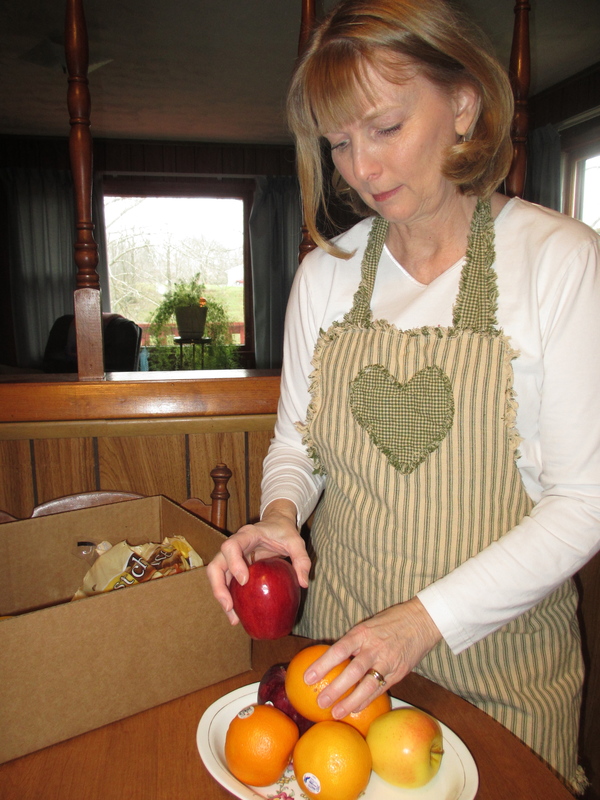 What a great way to spruce up ordinary tissue boxes! See more photos and detailed instructions on the project page. Take advantage of our Sweetheart Sale prices to customize these projects to your own tastes! And send us photos of your finished products so we can show off YOUR work on the blog! Today (January 28th) is the last day to enter the giveaway for the Bright Ragged Homespun Quilt KIT. If you haven’t entered, leave a comment on the Quilt Kit GIVEAWAY post before midnight tonight! 2012…..wow! We hope that you all had a wonderful Christmas. Ours was very busy but full of good things — my daughter participated in her first Christmas program at church and we were able to see both my parents and my husband’s parents during the Christmas season. I even sewed my mother-in-law’s Christmas present using Jubilee fabrics – surprise, surprise! I sewed this reversible apron using three complementary patterns of our Garden Greens fabrics. She loved it and I was happy to make her something that she could use! Are you anxious to start some sewing projects now that the busyness of the holidays is over? 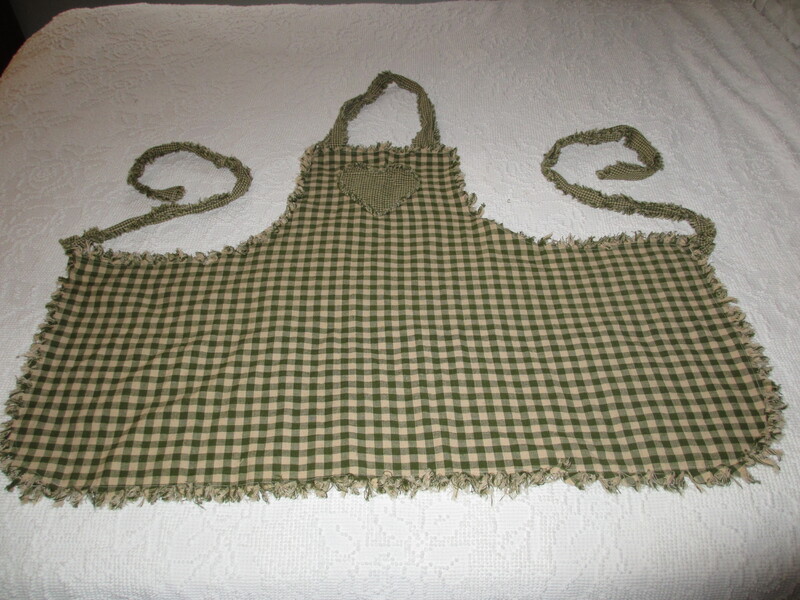 Or maybe you got a sewing machine for Christmas and want to try out a simple rag-style project like this apron? Either way — we’ve got a sale to help you get started! Enter the coupon code JOY2012 at checkout to receive 10% off all fabric by the yard. A $20 minimum purchase is required. The sale ends Saturday so make your selections and start 2012 on the right sewing foot! 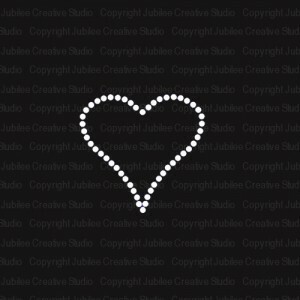 We’re also running a big sale in the Jubilee Rhinestones store. We’re offering 25% off iron on transfers and loose stones with a $20 minimum order. The coupon code is JOY2012. This sale also ends Saturday so act now and make 2012 sparkle! I know I’ve talked about our customizable designs before but I’m going to mention them again because we have NEW designs, NEW minimum orders, and they’re on SALE! Simply choose the color (when applicable) and provide your own text and we’ll do the rest. Customizable designs are perfect for schools with unique mascots, special events, small businesses, sororities, and other clubs and organizations who need a little customized bling. Whereas we used to require a 50-piece minimum order for customized products, we’ve now lowered that minimum to only 25 pieces. Most of our customizable designs are 20% OFF through Sunday, November 13th! If you’re interested in one of these customizable designs then this weekend is the perfect time to try them out. 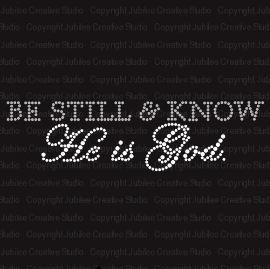 We’ve recently added a new line of Latina iron on rhinestone transfers. We offer feminine script ABUELA and ABUELITA designs that can be worn alone or paired with our OF THE BRIDE or OF THE GROOM wedding designs. There is also a fancy swirly QUINCEANERA transfer to make that important day even more special for a young lady. I just can’t get over how cute the FELIZ NAVIDAD design is! I love the holly leaves and berries! I think I may be sporting this design on a t-shirt this Christmas. Design Contest Winners and BUTTONS! Exciting news in the Jubilee Fabric store — WE’VE GOT BUTTONS!!! Adding buttons to the fabric store makes so much sense to us. Many items created with our homespun fabrics need buttons, whether for fastening purposes or just because they make such cute embellishments. We’re hoping to having some pictures of projects we’ve done with these buttons and our homespun fabrics soon. The buttons we have added to our store look great with our homespun fabrics but they can also inspire creative projects of their own. I’ve seen pictures of people using wooden buttons to make earrings and other jewelry, as well as unique homemade art that can be framed and hung on the wall. I’m thinking the daisy flower buttons would make especially cute earrings! Check out our selection of buttons and be inspired! On sale now at a special introductory price! Our design contest is over and there were so many good suggestions that we’ve chosen THREE winners instead of just one! Thanks to everyone who made suggestions. It was fun reading all of your great ideas! Congratulations to Jeannie for suggesting a COWBOYS design, Shelly for her DANCE MOM suggestion, and Trisha for suggesting a GOT ____ ? design. (We’ve decided to go with GOT BLING?) Jeannie, Shelly, and Trisha — you will each receive a complimentary iron on transfer in the design you suggested as soon as they are added to our stock inventory. Our stellar graphic designer has already whipped out a DANCE MOM design! Watch for the other two new designs to be hitting the Jubilee Rhinestones store in the new few weeks! One of my favorite Fall activities is football. I don’t play football — haha, that would be interesting — but I love the sights, sounds, and smells of a high school or college football game. The thrill of victory! The agony of defeat! Regardless of the final score, there’s just something exciting about standing in the bleachers on a chilly night under the bright lights and cheering for your favorite team. It’s a unique experience that no other sport offers, in my opinion. We have a variety of football iron on rhinestone transfers for moms, girlfriends, cheerleaders, and fans. As you know, we’re all about mixing and matching designs to create that special combination that is perfect for you. These are some of our iron on transfers that work perfectly with our football motifs. –Wednesday, August 17th is the last day to suggest a new design for our contest. The winning design will be added to our stock inventory and the person who suggested it will receive a free iron on transfer of their design. Leave your suggestion as a comment on our What’s Your Bling Dream post! –We are still offering 20% off all of the iron on transfers in the SPORTS category through August 25th with a $20 minimum purchase. Enter coupon code back2school to get the discount. 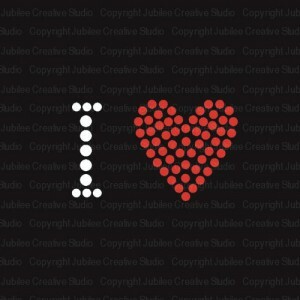 –We’ve got some exciting news in the Jubilee Fabric store! 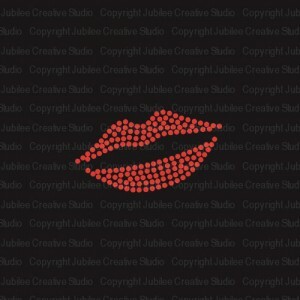 Check out the website for a sneak peak and stay tuned for a Jubilee Fabric giveaway on the blog! It’s back-to-school time and that means it’s time for some sports bling! We’ll be highlighting our sports iron on rhinestone transfers this month and we’re starting with MASCOTS! In order to get everyone into the spirit of things, we are offering 20% off all of the iron on transfers in the SPORTS category through August 25th with a $20 minimum purchase. Enter coupon code back2school to get the discount. Are you ready for some football??? And basketball, baseball, volleyball, track, cheerleading, etc.? No matter the sport we’ve probably got a mascot design for you! Our iron on rhinestone transfer mascots sparkle and bling so you can support your favorite team without compromising your flashy style! Basically, they’re just fun! We offer 26 mascot name transfers — everything from Hornets to Panthers — as well as images for 13 mascots. You can have a lot of fun creating your own unique fan shirt by combining multiple transfers. This Panthers transfer combines the word PANTHERS with the panther image. It’s a good example of how you can use the mascot name and image together. The mascot names can also be paired with words like Lady or Mom or Football or Coach and then personalized even further with a specific jersey number. It’s easy to mix-and-match! As you can see in the example, you don’t have to limit yourself to sports-related images. Peace. Love. Tigers. 1. We do custom orders! Read our Custom Design Information page for more details. 2. We are currently taking suggestions for new designs here on the blog! Leave a comment on the What’s Your Bling Dream post and if we choose your design idea to add to our stock inventory then you will get a free iron on transfer of your design. 3. We sell individual alphabet letters in several different styles! You can order letters to spell any mascot name. So make yourself a sparkly t-shirt, dig out that big foam finger in the garage, and prepare to cheer your team to victory! Go team!